Dubai: Even an 11 square kilometre city-within-a-city needs a mall. The design of one Dubai’s next-generation mall projects — located at Dubai Hills Estate in MBR (Mohammad Bin Rashid) City — is being worked on, according to a senior official with the developer, Emaar. 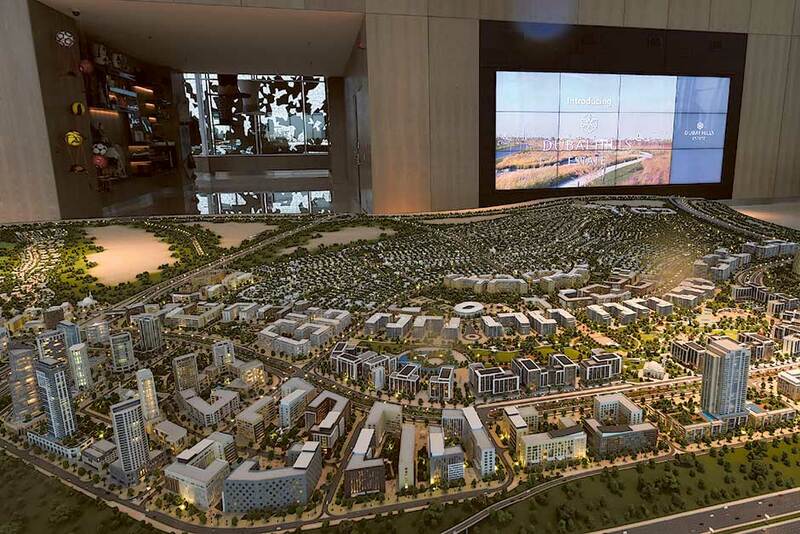 In the master plan for Dubai Hills Estate, the mall is located at one end of a 7-km stretch fronting Umm Suqiem Road. It will take up quite a generous spread of land, and should have a gross leasable area of 1.5 million square feet. Further details regarding the launch are still being kept under wraps pending a final approval of the design. This is the third major mall project that Emaar will have in its portfolio, after The Dubai Mall and the one in Dubai Marina. Under the current plans, the mall will be connected to two hotels. There is another massive retail development planned in the wider area, the Meydan One Mall (and to feature the world’s largest indoor ski slope among other things) from Meydan Group. Dubai Hills Estate itself is a joint venture between Emaar and Meraas, and will feature 26,000 plus residences and a resident base of more than 100,000 people. There are to be two metro lines and as many as three stations. The villas and apartments launched to date had launch prices of between Dh1,000-Dh1,700 a square foot. “We are currently working on three zones simultaneously,” said Yasser Mostafa Nabil, Senior Director — Development, Emaar Properties. “We have already had multiple sales launches involving very high-end villas as well as smaller sized single-family homes and multi-family apartment buildings. “The infrastructure works for the initial phases are already advanced — in fact, the infrastructure feeds directly into what we are constructing. “For the low-density zones, on offer are shell-and-core villas near the golf course and even plots that buyers can build to their plans.” (These villas could well be among the costliest under development in Dubai this side of those in Emirates Hills.) The first residents are to start moving into the cluster, at the golf villas by late summer. The “Mulberry” units are on schedule for a 2018 handover. (With some of its recent Dubai Hills Estate launches, Emaar had been sweetening the deal by allowing 40 per cent of the payments to be made over two years post the handover. No specifics have been given about the duration of the entire project. But an eight tower cluster surrounding one of the metro stations will be among the last set of works to be taken up. These are to feature offices and residences. In terms of the sheer scale of what is to be built, MBR City, Meydan One and Deira Islands are the three largest mixed-use developments in Dubai as of now. MBR City is shaping quite nicely and seemingly at a fast clip; apart from Emaar-Meraas, the Meydan Group and Sobha too have a sprawling project in-development and recently had the third round of villa sales there. For any ultra-wealthy investor who turned up too late to buy in Emirates Hills, Dubai Hills Estate and other options in MBR City could be just what they are looking for. The recent option of ultra-luxury villas, where you can build your own façade by Emaar has been in the form of Dubai Hills. “A comparison between Dubai Hills and Emirates Hills plot prices, shows that he latter trades at roughly a third of the price,” states a recent report from Global Capital Partners. “An analysis of Emirates Hills during its development stages reveals that prices accelerated dramatically as surrounding infrastructure began to roll out. Emirates Hills is spread over 10 sectors, with sectors E and P accounting for around a third of supply. The 622 villas vary from 10,000 to 45,000 square feet.